This is a brilliant new product in our ever-growing range of protective packaging solutions. Like our air cushion systems, Sealed Air Instapak Quick RT has been designed so that it can be delivered flat; that means that it takes up the minimum amount of your storage space possible. 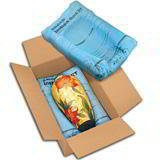 Then, when you place it in a carton, it self-inflates and moulds itself around the contents, ensuring your product is fully cushioned and unable to move about when in transit. Instapak foam packaging is becoming an increasingly popular packaging option and, this being Davpack, you can get it here cheaper and quicker than just about any other UK packaging supplier.